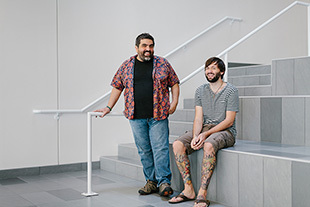 Students at Columbia College Chicago are no longer just making art—they’re now helping conserve, preserve and restore it. Students at Columbia College Chicago are no longer just making art—they’re now helping conserve, preserve and restore it. During this past academic year, the first cohort of students from the Art and Materials Conservation program in the Department of Science and Mathematics studied at the Lorenzo de' Medici Italian International Institute (LdM), a prestigious institution of higher learning in Florence, Italy, with which Columbia College Chicago has a longstanding partnership. 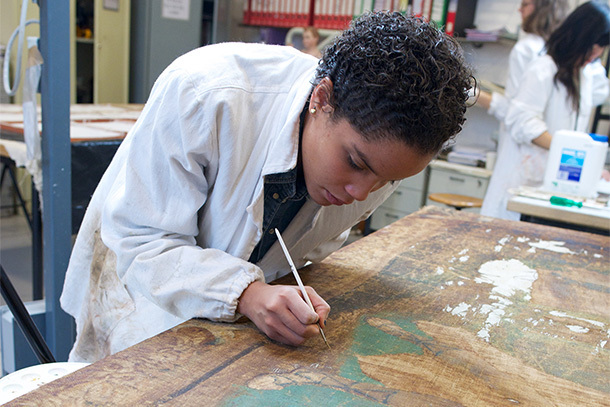 This partnership was formalized in 2011 when the Department of Science and Mathematics launched an undergraduate program in Art and Materials Conservation, a major that balances essential, science-based learning with a required year of hands-on study at LdM. 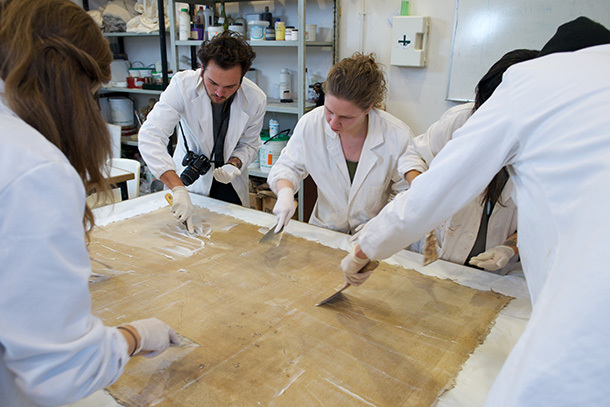 The students featured in the pages that follow worked on objects from the 16th, 17th and 18th centuries throughout the 2013-14 academic year, all while immersing themselves in one of the most celebrated and art-rich cities in the world. Chantil Clement (BA '15) uses gouache, a translucent paint similar to watercolor that was thinned down for the purpose of restoration, to place natural tones into a seventeenth-century tapestry that has areas of missing pigment. 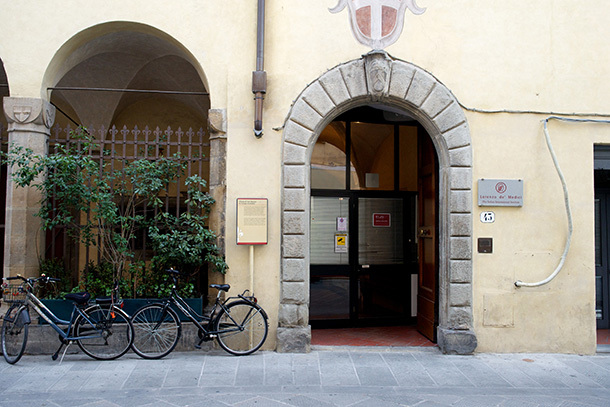 The Lorenzo de' Medici Italian International Institute was established in 1973 as a private institution of higher learning in Florence, Italy. The institute offers international higher education and has smaller campuses in Tuscania, Rome and Venice, in addition to its main campus in Florence. Courses fall under four primary areas: arts and sciences, creative arts, design, and Italian language and culture. The cohort applies vegetable glue to the back of a painting. 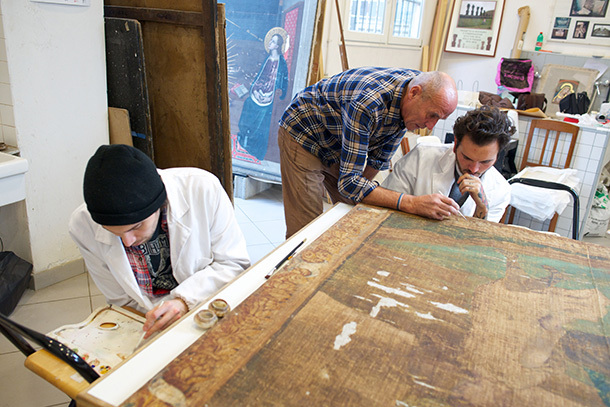 This process, which is common in Italy but not in the United States, realigns the work of art to give it more support before it’s placed onto a new canvas. 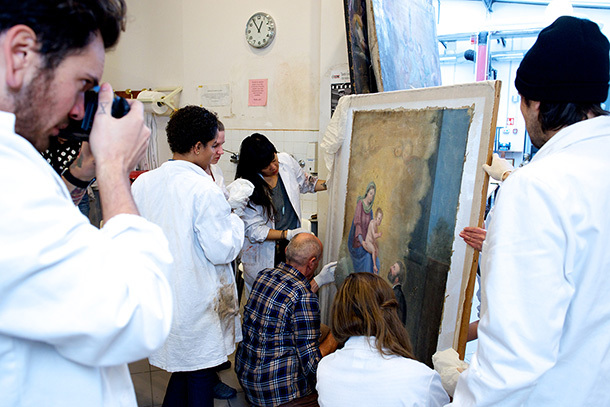 “I had never done this before we went to Italy,” says Diana Jaskierny (BA '14, center), who was recently accepted into the graduate program in Conservation of Easel Paintings at The Courtauld Institute of Art in London, England. 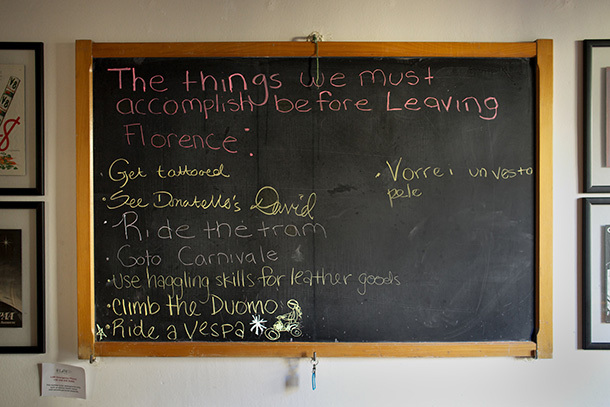 In addition to studying with professional conservators at LdM, students in the Art and Materials Conservation program share apartments with other students in their cohort in the city of Florence, where they are immersed in Florentine life and culture. This chalkboard was spotted in one of the apartments. 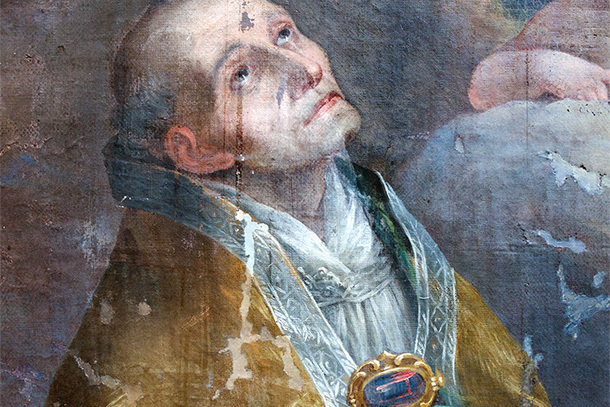 This oil on canvas painting from the seventeenth century is titled Lo Spirito Santo (artist unknown) and arrived at LdM in 2011, having been retrieved from an Italian church. The entire cohort worked on this painting at various stages throughout the year by filling in areas of lost paint, by color matching and by varnishing the painting once it was restored. 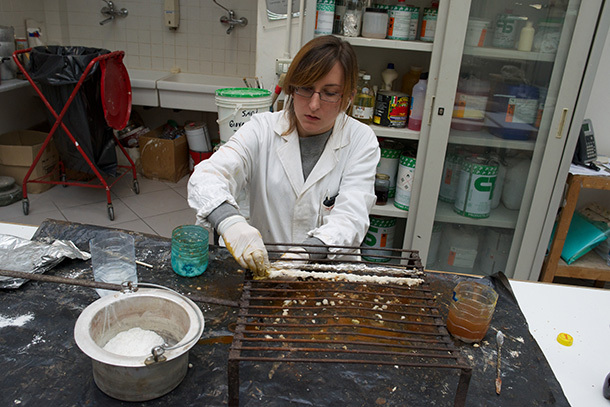 Allison Cassidy (BA '15) removes oxidation from a metal grill by using a poultice and a fifteen percent Ethylenediaminetetraacetic acid (EDTA) solution mixed with water.